Winter is always the season for soups or stews. Over the next few Saturdays, we will be posting awesome recipes that will keep you warm this winter. To get our "Soup"er Saturday started, we are featuring Jenny of Picky Palate. 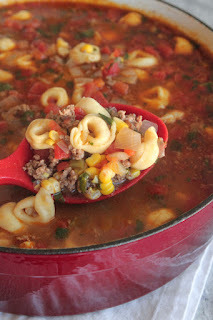 Jenny has a wonderful Tortellini Taco soup that will be sure to please every member of the family! Not only is it hearty and tasty, it makes an easy weeknight meal too - perfect for your busy schedules. For the recipe, please click on the photo above.